Most people eat eggs that have been heated. Scrambling, frying and boiling are all popular methods of cooking eggs. What most people don't realize is that the way you cook your eggs can change their nutritional content. Eating raw eggs can be an easy way to maintain these nutrients but may not be the healthiest way to eat your eggs. Cooking your eggs can help your body absorb certain nutrients and reduce your risk of food poisoning caused by bad bacteria like Salmonella. Despite their reputation for carrying bacteria like Salmonella, it can be perfectly healthy to eat raw eggs. However, it might be better for you to eat lightly cooked eggs as this makes their nutrients more digestible. Eggs are extremely popular as they're delicious and filled with nutrients. Along with the standard vitamins and minerals, eggs contain antioxidants and carotenoids, like lutein and zeaxanthin. These nutrients are good for the health of your eyes and have also been shown to reduce the risk of issues like Alzheimer's disease, cancer and heart disease. Eggs are also a good source of healthy fats. These days, many eggs sold in supermarkets (usually chicken eggs) are often enriched with even more healthy fats like omega-3 fatty acids. Omega-3 fatty acids are good for your heart, brain, nervous system, immune system and eyes. Large chicken eggs, which are about 50 grams (1.76 ounces) in size have 71.5 calories each. They also have small amounts (between 1 and 4 percent) of a variety of other nutrients, including B-complex vitamins, vitamin E, calcium, copper, magnesium, manganese, potassium and zinc. You should know that different eggs have different nutritional values. Even when accounting for size, quail eggs have more vitamin B2 and iron, while duck eggs have much more vitamin B12, iron and cholesterol. When possible, you should vary the types of eggs you consume. Given their somewhat slimy nature, raw eggs aren't most people's first choice. You might be surprised to learn that many common food items actually involve the use of raw eggs. Salad dressings, dips, sauces, desserts and beverages frequently contain raw eggs. A few specific examples include mayonnaise, carbonara sauce for pasta and tiramisu. Raw egg products sold in supermarkets aren't the same as products sold in restaurants or made at home, though. Products containing raw eggs that are sold in supermarkets are pasteurized. The Food and Drug Administration recommends choosing pasteurized eggs for raw egg products whenever possible. 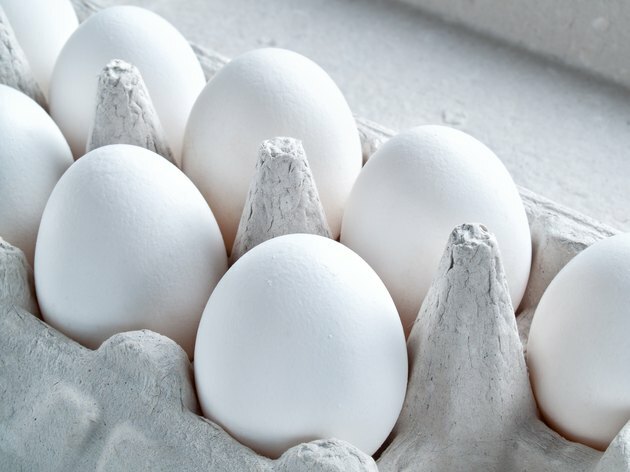 If you can't obtain pasteurized eggs, make sure the eggshell is clean before you crack it open and try to use eggs that are as fresh as possible. Eating raw eggs has a variety of positives. Eggs are easy to crack open and mix into a drink or drop into a soup. And they're nutrient rich, so whether you're eating egg yolks or drinking egg whites, you're bound to obtain a variety of healthy vitamins, minerals, antioxidants and omega fatty acids. The main benefit of raw eggs is that you don't have to cook them. Cooking methods can cause compounds called glycotoxins, which are related to diabetes and other types of chronic disease, to form in your food. These glycotoxins develop when you overcook foods or cook them on high heat. This means that raw eggs have no glycotoxins, eggs cooked at low to medium heat have a little, and fried or hard-boiled eggs have quite a lot. In addition to having no glycotoxins, raw eggs are healthy because they retain more nutrients than cooked eggs. After cooking, eggs often show reduced amounts of antioxidants and omega fatty acids. Cooking methods that involve high temperatures and lengthy cooking times (like hard-boiled and fried eggs) cause nutrients to degrade, which means raw eggs have better nutritional value than cooked eggs. The main downside to eating raw eggs is the risk of Salmonella. Salmonella bacteria are among the top 10 causes of food-related health problems and can only be killed with heat or changes in pH (like changing the acid-alkaline balance when pickling or curing). This is why, if you choose to eat raw eggs, you should consume only pasteurized ones. According to the U.S. Centers for Disease Control and Prevention, one egg out of every 20,000 might be contaminated with Salmonella, which can lead to food poisoning-related symptoms, like digestive system issues, dehydration and fever. Cooking eggs is obviously an easy way to kill Salmonella. However, cooking eggs can also help your body absorb certain nutrients. The effect that cooking your eggs has on digestibility has been well-studied and has shown that cooking your eggs can help your body absorb protein. Only about half of the protein in raw eggs can be absorbed compared to cooked ones. This means that even though there might be more nutrients in raw eggs, they may be less healthy because your body might struggle to absorb them when they haven't been cooked. While the nutrition in raw eggs might not be as easy for your body to process, overcooked eggs can be just as challenging. Overcooking your eggs influences their digestibility in exactly the opposite way. Fried and hard boiled eggs are more difficult for your body's digestive system, compared to lightly cooked eggs, like soft-boiled eggs. Ultimately, this means that whether you're looking at the absorption of nutrients or development of glycotoxins, the healthiest type of egg is likely one that is cooked at low to medium heat.